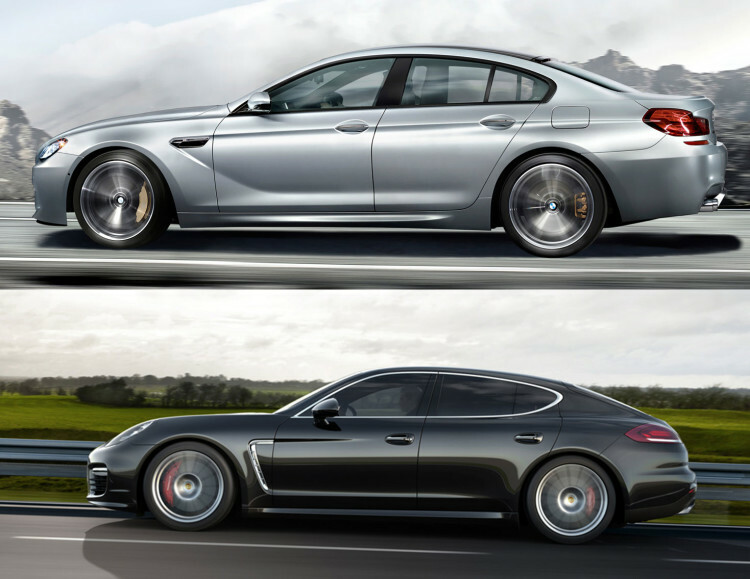 BMWBLOG test drives and compares the BMW M6 Gran Coupe vs. Porsche Panamera Turbo. Which one is faster? The BMW M6 Gran Coupe and Porsche Panamera Turbo are two über fast executive German conveyances that occupy rare air. Carrying four adults in incredible comfort, they are capable of insane speeds in addition to holding their own on a race track. In this comparison BMWBLOG tested both cars on the street and the track where we could let them run free. The similarities between these two are uncanny. Both are within an inch of each other in total length, and are separated by just 13 pounds in curb weight. The two German-built four-door super sporty cars are powered by TwinTurbo V8s cranking out over 500 hp and over 500 lb-ft of torque, and require a stout bank account to acquire. As is expected with cars that cost well into six figures, they coddle the driver and occupants in gorgeous interiors and seamlessly incorporate the latest technology in both chassis control and cabin electronics. Here, however, are where the similarities end. The BMW puts the power down through the rear wheels and employs a trick Active Differential which can completely disengage at low speeds, decreasing understeer. The Porsche sends the power to all four wheels through their PDK dual clutch transmission. The M6 Gran Coupe comes standard with Dual Clutch Transmission (DCT) but gets a six-speed manual option at no cost option in the US. The Porsche Panamera admittedly has polarizing looks. Though the Porsche purists decried the thought of a four-door sedan when it made its debut in 2010, it has had solid sales. The most peculiar aspect of the Panamera is the bulbous derriere which struggles to incorporate its hatch back lift gate. The hatch back does make it more practical but the overall look is odd to this scribe. The interior, however, sets a new standard for Porsche. The cockpit has an enveloping feel with a sloped center console and a myriad of buttons. The console’s crazy number of buttons demonstrates Porsche’s “one button, one function” philosophy. The circular gauges are classic Porsche with five round gages keeping the driver informed. The center dial is the largest and houses the tachometer. To its right a configurable display screen that can actually showcase the tire pressures or navigation, among other features. One of the things I really love about the Porsche is the ability to give you a live read out of the tire pressure. The steering wheel comes standard with the infuriating thumb button shifting which is counter intuitive. A paddle shifting wheel is optional and in my opinion worth the extra cost. Pull the right paddle on this optional paddle shifting wheel and you shift up. Pull the shifter on the thumb (dumb) version on the right and you get the opposite response, it shifts down. Arrggghhh! The BMW M6 Gran Coupe is drop dead gorgeous from any angle. In fact, I think it’s the best looking BMW they currently make. The M6 Gran Coupe has a very aggressive stance with 20” wheels wrapped around low profile tires 265/35(F) 295/30 (R) pushed out to the edges of the wheel arches. The front fascia not only looks great but is actively channeling massive amounts of air into the radiators at speed. The five-double spoke 20” wheels fit nicely over the massive carbon ceramic brakes that were on our tester. The M6 Gran Coupe is topped with M’s signature Carbon Fiber Roof panel that helps push the center of weight down. The interior of the M6 Gran Coupe is a combination of luxury, premium and sportiness. The seats are very supportive and not tiring. The steering wheel is thick and beefy and nicely weighted. Paddle shifting is included with the DCT transmission and rips off lightning quick shifts just as the Porsche’s PDK. On the console by the DCT gear shifter there are settings for the chassis, steering, and shifting. I spent quite a bit of time trying to figure out which combination of settings and shift speeds and settled on Sport mode for all three. Fortunately when you figure out which setting combo you like, you can store it in to one of the M buttons on the steering wheel. Topping off the BMW’s driving experience is the optional Head-Up display which IMHO is the best in the business. Unfortunately, BMW’s Tire Pressure Monitoring only tells you when you are low, not the actual pressure. No surprise here, the Porsche is a very composed and dynamic car. The seating position and view out the front window reminds me very much of sitting in a 911. Steering wheel communicates feel from the road extremely well, much better than I thought a car with all-wheel drive would. 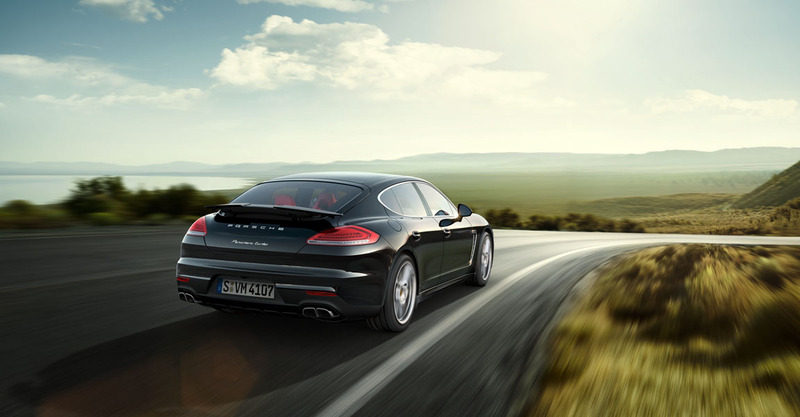 Launch control the Panamera Turbo from a dead stop, and be prepared for a wicked ride. All the wheels claw for traction and you rocket out of the hole with the PDK rapid fire shifting away. OMG! The immediate forward thrust combined with the wicked roar of its V8 makes you want to keep your foot in it. Then above 56 mph the rear wing spoiler pops up. This goes up and wing tips pop out to increase the down force. The attack angle varies from -3 degrees to +10. Super cool but I wonder how it will last with time and use. On track you are definitely aware of the weight but it’s very manageable with the grip and huge optional carbon ceramics on my tester. The all-wheel drive allows you to get on the power early when coming out of the corners. There is some understeer but not as much as I thought there would be. Driven hard for a full session, you will note the tire pressures climb. In fact, it can climb enough that the center of the tires wears out first. Just sayin’. Getting out of the Panamera Turbo with that wonderful hot brakes, the fresh off the track smell, the drivetrain and exhaust ticking the heat off, it hit me. Now I get the Panamera. The looks are only half of the picture. Dynamically the car makes sense. There’s no way this car should accelerate, handle and brake like this. If one buys this car, you have really got to drive the hell out of it at least once. 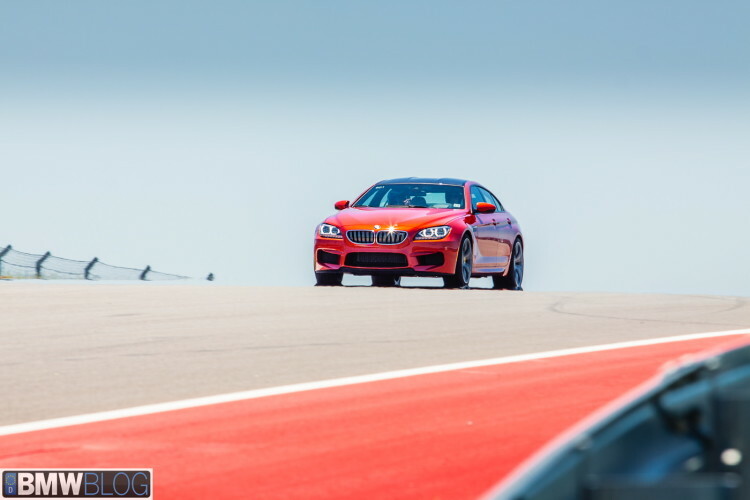 Like the Panamera, the BMW M6 Gran Coupe is a big car to take on a race track. It seems however the Germans have figured out how to make big cars handle on track because there is no way this M6 Gran Coupe should handle this well either. There is slight understeer in the M6 Gran Coupe but much more tail out oversteer on tap than the Porsche. No doubt a result of RWD. The motor in this BMW is rated at 560 hp but it feels like a conservative rating. Off the line the Porsche is quicker because of its all wheel drive but the BMW closes the gap quickly and then doesn’t look back. This seat of the pants feel is borne out in the testing figures from Car and Driver. 0 – 100 mph for the M6 Gran Coupe is 8.0 seconds, and the Porsche takes 8.2 seconds. Keep going to 130 mph and the BMW is now 1.3 seconds ahead. With 10 mm more width on both the front and rear tires, the BMW should have more grip but Car and Driver gave both cars 0.92G. An incredibly high number for four-door passenger cars. BMW’s new Carbon Ceramic Brakes were fitted on the M6 Gran Coupe and they are a welcome addition to BMW M cars. I say this because these will stop the car so hard that they make you feel like you are gonna go through the front windshield. They also just don’t fade, not even from 150mph! They are a necessary $9,250 option if you plan on taking the M6 Gran Coupe to the track. An added benefit of the 16” Carbon Ceramic rotors is the 42lbs of unsprung rotating weight removed from the car. The M Active Differential can vary its lock from 0-100% and really helps track performance. The car constantly knows every wheel speed, the yaw rate and accelerator pedal and calculates what will be needed next from the differential. Full flat acceleration coming out a turn it will go to 100% lock. Electronic Displays and Nannies are bountiful in both cars and are an expected amenity at this cost level of car. Speaking of costs, the M6 Gran Coupe does ring in at $26,300 less than the Panamera Turbo. The Porsche’s Ceramic Brakes are optional at $9210 but necessitate a bigger wheel package which can add an additional $1500-$4000 just to fit around the brakes. Though similar in size, 4.4L vs 4.8L, the German powerplants are engineered rather differently. BMW’s S63Tü 4.4L is designed with a hot V approach where the turbos are on the inside of the V portion of the motor. 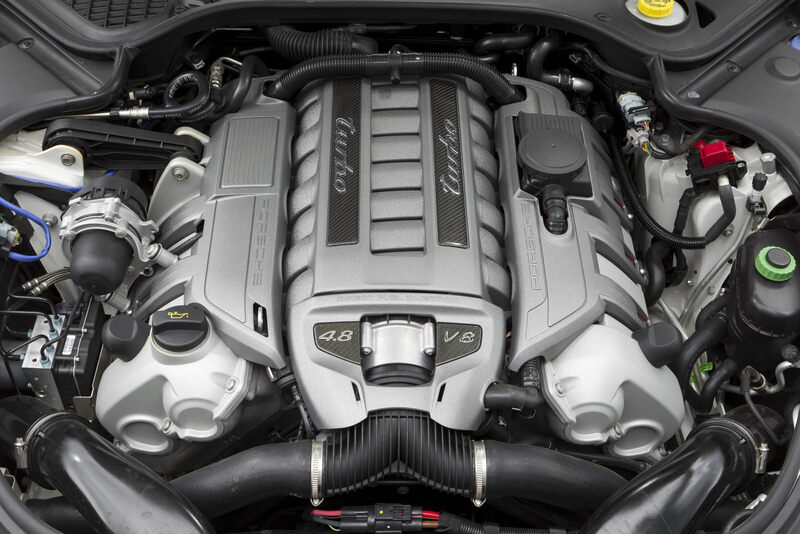 This 4.4L Twin Turbo V8 is a high-revving engine with a 7100 rpm redline. The engine’s character is very much like the naturally-aspirated engines and pulls hard all the way to the top. BMW also has an extra turbo pressure that it can utilize when running in a hot climate. Tremendous cooling capacity to the TwinPower Turbo V8 is used to tame the heat this monster can produce. Further airflow is channeled over the top of the motor. BMW uses a high precision injection system with massive intercoolers to keep the charged air cool. 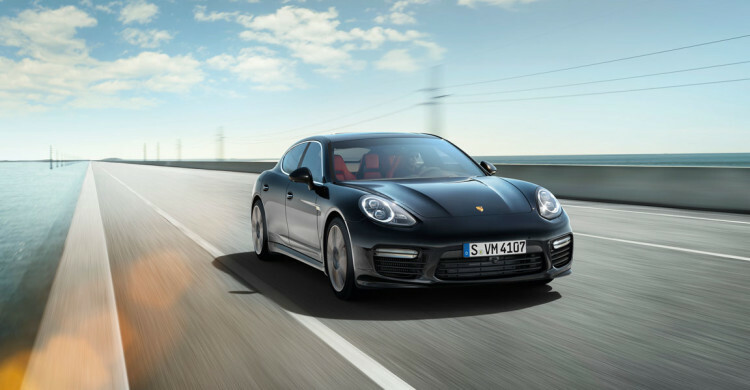 The Panamera Turbo is powered by a 4.8-liter TwinTurbo V8 but has the turbochargers on the outside of the V where heat is more easily shed. 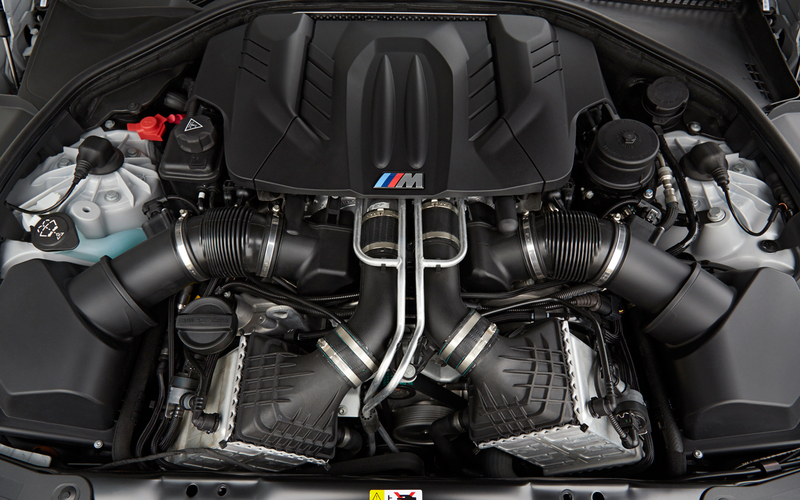 Intake air is compressed and then fed to the engine by the respective charge-air cooler for each four cylinder bank. Performance figures: 520 hp at 6000 rpm. The maximum torque of 516 lb-ft is achieved between 2250 and 4500 rpm. Top track speed is reached at 189 mph. Redline tops out at 6600rpm, 500rpm less than the M6 Gran Coupe. With the Launch Control function of the optional Sport Chrono Package, the 0-60 time decreases to 3.7 seconds. Why this is optional on a $140,000 500hp car is lost on me. At this price point buyers make decisions for reasons that might not come down to which one is fastest around a track, or which one is faster 0-60 or 0-100. It might come down to things such as dealership experience, who treats them better when the walk in the door or which car makes a bigger impression at the country club. These cars are so close in size, offer insane performance and out right luxury. All those things aside however, I think the BMW M6 Gran Coupe takes this comparison. It is gorgeous from any angle and offers pure tail out tire smoking hooliganism when needed. The Panamera Turbo, while a very satisfying car to drive, looks like its rear end was designed by a third grader. The Panamera Sport Turismo concept is a much better looking design but not being produced. All those things aside however, I think the BMW M6 Gran Coupe takes this comparison. It is gorgeous from any angle and offers pure tail out tire smoking hooliganism when needed.